Congratulations to the Jerry Davis Center for children and families for receiving the 2015 Somerset County Disability Advocate Award! The Jerry Davis Center for Children and Families, established in 1972, has been providing quality services to children and their families for over 40 years. Our New Jersey licensed childcare facility is located in Manville and easily accessible from most major Somerset County roadways. The mission of the Jerry Davis Center for Children and Families(JDCCF) is to ensure every individual's optimal growth and development. JDCCF's comprehensive, interdisciplinary programs are designed to meet the physical, cognitive, social, and emotional needs of children who have a diverse range of abilities. These programs are staffed by dedicated professionals including teachers who may be licensed and certified in both early childhood and special education. We challenge, nurture, respect, support and inspire all participants and staff to excel and achieve their personal best. Developmental Childcare provides a safe and nurturing environment for the development of children aged 3 months to 7 years. Our classrooms include children with and without special needs in an inclusive environment. The center is open, from 7:30 a.m. to 6:00 p.m , and offers Before and After Care for children who attend Preschool Disabled Programs. 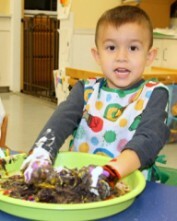 Inclusive Developmental Preschool provides exposure to kindergarten readiness activities to children in Developmental Childcare who have met their developmental milestones and have the skills to complete higher level tasks. Individual and group activities are offered including music appreciation, gym, and dance and focus on the development of communication skills. Therapeutic Services offers evaluations and private therapy services for children from licensed and experienced Speech, Occupational and Physical Therapists as well as Special Education Teachers. A variety of therapeutic classes year round are offered to children in the community to meet children's developmental needs. The school is open from 7:30 a.m. to 6:00 p.m. with Before and After Care available. Flexible schedules are available to accommodate parent's busy schedules. Where children are challenged and grow. To contact the Jerry Davis Center For Children and Families, please call 908-725-8544, x629 or email jillg@thearcofsomerset.org.